Some time ago we were asked if it would be possible to erect blue plaques - as seen on many historical buildings and sites up and down the country. This initiative has now come to life and we have placed four plaques around the village. These plaques give a brief history of the site or building which we hope will stimulate more interest in Coleorton's heritage among residents, locals and visitors. On Saturday afternoon 13th October at Viscount Beaumont's School we formally launched the Coleorton "Blue Plaque" scheme. 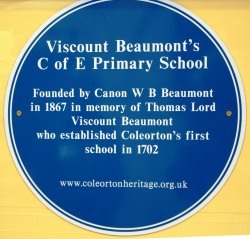 One of the first sites is Viscount Beaumont's School. It's a lovely building with loads of history. Thank you to the head teacher Mrs Leadbeater who brought along some of her pupils to tell us about their experiences of the school. Coleorton Heritage Group is a small local group of interested residents with pretty limited resources to take on projects and with this project, as with some of the previous ones, we have been helped enormously by grants and support from various sources. Financially we have received grants from North West Leicestershire District Council – thankyou to them and we welcomed chairman John Clarke of the NWLDC and from Coleorton Parish Council – Chairman Michael Specht both of whom attended and said a few words. We also receive moral support and encouragement from the County Council. Thank you Cllr Ozzie O'Shea, chairman of the Leicestershire County Council and our Member of Parliament Andrew Bridgen who both spoke encouragingly about the importance of community heritage. Sandra Dillon opened the event and introduced the children Reuben Robbins, Jorja Morris, Poppy Connell, Max Witherington and Lola Witherington, who told stories of their school. Terry Ward then gave a short account of the background to each plaque. When the speeches were over, two of the children unveiled the first plaque of the school with Andrew Bridgen MP. 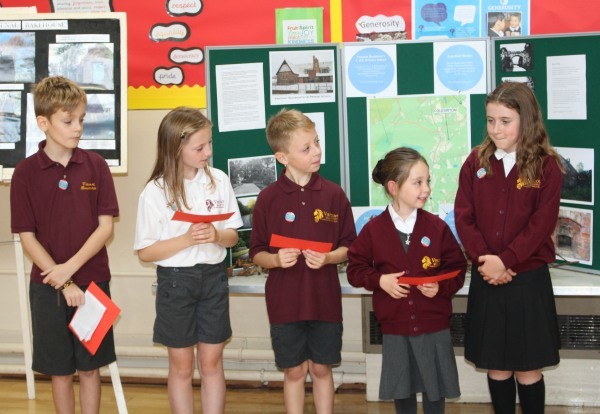 At the event we displayed some of the projects we have been involved with, including the NW Leicestershire "Hello Heritage 2018" event, for which we organised two "Coleorton History" walks. After the formalities, visitors were invited to view the Group's displays whilst enjoying a finger buffet and later taking the opportunity to purchase some of the group's memorabilia and the Coleorton 2019 calendar. We also had on display 6 of the "Fifty Fantastic Females" from The Hero Project. These are life-size cut-out figures of famous or significant women and decorated and dressed by local individuals or groups. See more at the Hero Project website. 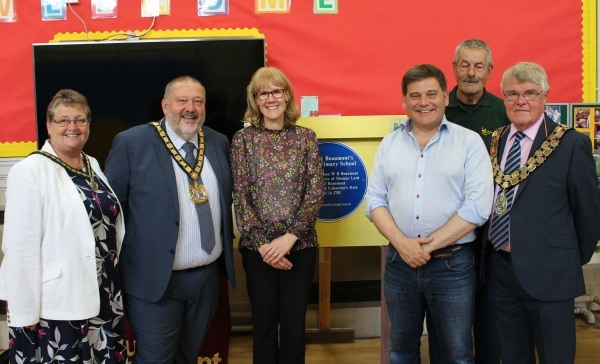 The Heritage Group would like to thank North West Leicestershire District Council and Coleorton Parish Council for the funding, which has enabled the establishment of the project. They would also like to thank everyone who took part in the celebrations, especially the children and the volunteers, who came and made the event successful. Information about the various "Blue Plaque" sites can be found by clicking on the items on the "Blue Plaque" list. Further plaques will be erected over the coming months - so look out for them on your walks around Coleorton. The Group is always in action in a variety of ways. If you would like to join them, if you have any questions about local history or heritage or if you have any stories to you'd like to share please contact Sandra on 01530 440000 Email: heritagegroup@coleorton.org.uk.